AS A teenager, Mr Justin Tan took a shine to art and design, and quickly honed his craft. He told The Straits Times: "In secondary school, I was inspired by my art teacher. I thought there was probably something there, as I enjoyed mixing colours and all. "She taught and introduced me to different skills and software, and I realised that (area) was where I wanted to go into and went for it." With a clear goal in mind, Mr Tan, now 25, pursued a diploma in creative media design at Singapore Polytechnic (SP) and was a top graduate in 2009. Along the way, he bagged a string of awards in major global and regional design competitions, such as the YoungGuns Awards in the student category, and the Crowbar Awards, an annual platform for young creatives. Mr Tan added another feather to his cap with the Alumni Service to SP Award from his alma mater, which was awarded late last month. "I tried to expose myself to as many things as possible, attending all kinds of competitions, exhibitions or events related to design, within school and Singapore," he said. Nothing was out of bounds for Mr Tan, as the competitions were in varied areas ranging from graffiti to user experience design. He was a pioneer at school too, setting up The Student Agency midway through his studies. This is a design and advertising agency at SP run by students with the guidance of lecturers. "The agency takes in real-life clients. For me, it was like, 'enough of school assignments, I want to do something more'." The thirst to expand his horizons also led him to Yahoo India in Bangalore in 2008. "I went there alone for my internship, attached to the user experience design division. It's all about understanding the user's behaviour and how to design for the emerging market of India, and it exposed me to a more global view, rather than what is being taught." He was always seeking new experiences, even during national service when he was posted to the navy, where he kick-started a revamp of the navy's internal newsletter. It took on a lifestyle slant, becoming a magazine, and offered a glimpse into the day-to-day lives of seamen instead of more general reporting, said Mr Tan, who found it fulfilling to contribute to the changes. Keen on global exposure and armed with an impressive portfolio, he clinched a DesignSingapore scholarship in 2011 to study at the Royal Melbourne Institute of Technology, where he studied communication design, graduating with distinction late last year. "Design is not just about creating perceived value or beautifying things. There is more to it. To truly understand how different cultures can come together using design, or to improve processes or things around me, I needed to experience it first-hand. "I had to go out there and see how things were done," he said. 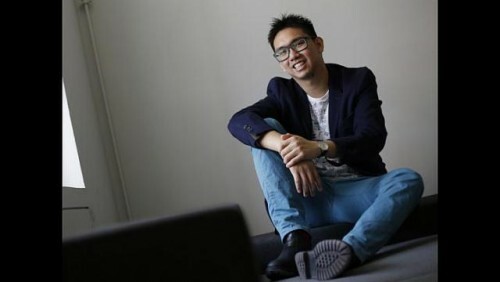 When he returned from Melbourne, he decided to buck the trend of building his career at a creative agency, choosing instead to set up his own design and innovation agency with his roommate, Mr Seow Zhi Hao, 25. The six-month-old firm is called APT811 (www.apt811.com), named after the apartment they used to live in back in Melbourne, where Mr Seow also studied. Mr Tan, the creative director, said: "We wanted to do something different and decided to address all the emerging trends, like how we started to see small and medium-sized enterprises approach things differently." They started with nothing except laptops, working on design jobs at Mr Tan's place. Earlier this year, Mr Felix Fong, a veteran who specialises in strategic brand development, joined APT811 and his experience and mentorship boosted the firm's growth, said Mr Tan. Taking on bigger jobs meant that APT811 needed to expand, and it now has six employees at its 96 Sophia Road office. "We find both the articulated and unarticulated needs of customers, to strategise and create meaningful brand experiences." The firm's clients include food and beverage companies. Even though his days are filled building up the firm, Mr Tan continues to conduct workshops and mentor SP design students. "I've always lived by giving and imparting knowledge to whoever needs it because it's all about sharing and helping. Because of my circumstances, I was able to learn, and I impart these lessons to others so that they can improve on what I have learnt." Mr Noor Azhar, course chair for SP's diploma in visual communication and media design, who was Mr Tan's lecturer and mentor, said: "It is amazing seeing how Justin has contributed to Singapore Polytechnic. There is no stopping Justin - he sees every opportunity to give back to the poly as a golden moment." Mr Tan believes his juniors should also experience working in a start-up or strike out on their own, as he did. "From there, you get to see things from a different perspective. And that is the best way to realise the dream and ideas that you have," he said.